Fred Hörz, Harald Kucharek, Ulrich Lotzmann, Dieter Stöffler, and Klaus Zeitner contributed to this discussion. Last revised 12 July 2012. 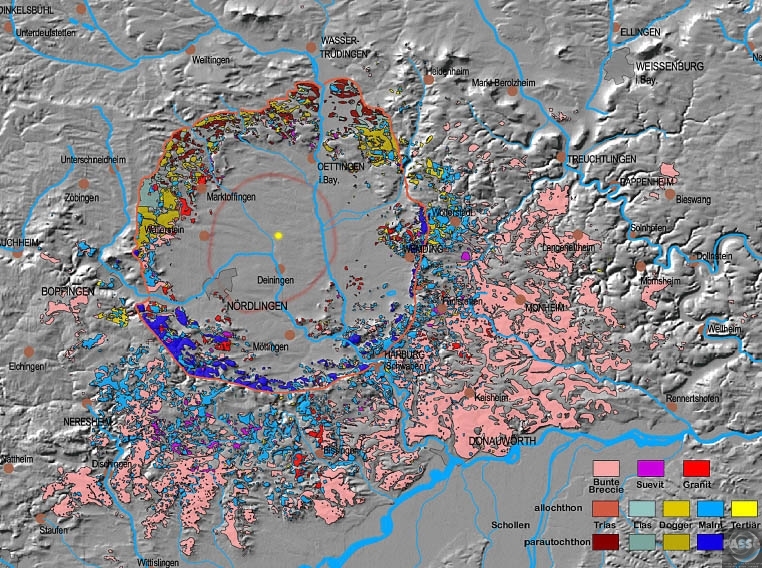 Relief Model of Ries Crater, which is an impact structure located 100 kilometers east of Stuttgart. 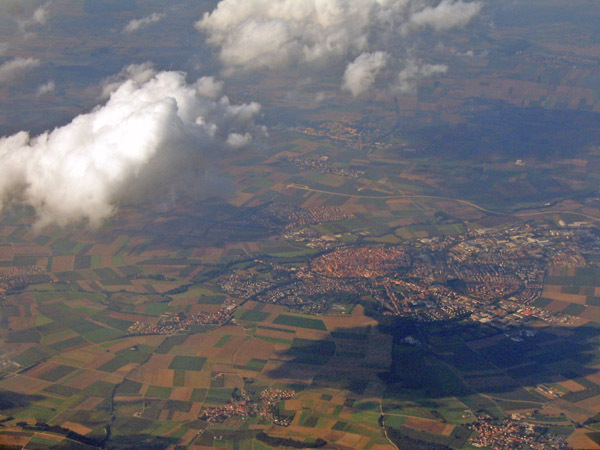 The crater is 25 km across, with the medieval town of Nördlingen on the crater floor. Ries Crater is about 15 million years old. Additional information can be found at the Rieskrater-Museum Nördlingen website and in the Earth Impact Data Base. Aerial view of Nördlingen at 1629 local time, 27 August 2007. Photo courtesy Lukas and Harald Kucharek. Quarry at Otting/Nördlingen Ries. From the left: Al Shepard, Dr. Fred Hörz (NASA), Ed Mitchell, Prof. Wolf von Engelhardt, Gene Cernan, and Joe Engle. Fred Hörz writes, "The Ries trip was initiated by Dr. Mike McEwen, the Apollo 14 Science Trainer of NASA; I assisted Mike, because I was at LSI (now LPI), about to be hired (ultimately in Dec.1970) by NASA as Apollo 16 Trainer and general 'crater' expert. Typically the NASA and USGS staff that came along on these field trips were in charge, with the local folks providing the expert details." one of the German geologists who hosted the astronaut visit. Quarry at Otting/Nördlingen Ries. Al Shepard and geologist Dr. Dieter Stöffler (right). Quarry at Otting/Nördlingen Ries. From the left: Al Shepard, Dr. Fred Hörz (NASA), Dr. Ed Mitchell, Prof. von Engelhardt, Gene Cernan, and Joe Engle. Quarry at Harburg/Nördlingen Ries. From the left: Mr. Abadian, Prof von Engelhardt, unknown, Dr Ed Mitchell, Joe Engle, Dr. Fred Hörz, Gene Cernan, Dr Stöffler, Al Shepard. Quarry at Harburg/Nördlingen Ries. Astronauts, instructors, reporter. Quarry at Harburg/Nördlingen Ries. From the left: Al Shepard, Dr. Fred Hörz, Dr Ed Mitchell, Dr. Mike McEwen (MSC), a U.S. embassy representative, Joe Engle (behind Embassy rep), Gene Cernan, and Prof von Engelhardt. Quarry at Harburg/Nördlingen Ries. From the left: Al Shepard, Gene Cernan, Joe Engle, Dr McEwen, Dr. Fred Hörz. Quarry at Harburg/Nördlingen Ries. From the left: Joe Engle, Gene Cernan, a US embassy representative, Al Shepard. Portrait taken at Nördlingen Ries. Al Shepard, Prof von Engelhardt (immediately beyond and slightly to the left of Shepard), Dr Stöffler (right of Shepard), Joe Engle (blue shirt beyond Stöffler), and others. Fred Hörz writes, "As you can see from some of the news clips, we had a difficult time handling the German press; the latter was more disrespectful of our needs and goals than any press I encountered during all of crew training. It was a real circus atmosphere wherever we went and whatever we did. Reports about beer and wine drinking, disgruntled authorities and quarry owners hit the national press. Also, following the field trip, the crew was 'hosted' by Daimler-Benz for a weekend. Reports about test-driving race cars and going elk-hunting etc also forced Deke Slayton to decide that it 'looks like too much fun and not enough work; no more Ries for Apollo 15, 16, and 17.' Too bad! We could never convince him otherwise!" All of the articles linked below were published in the Augsburger Allgemeine on the dates indicated. Used with permission. Scans and translations by Klaus Zeitner. 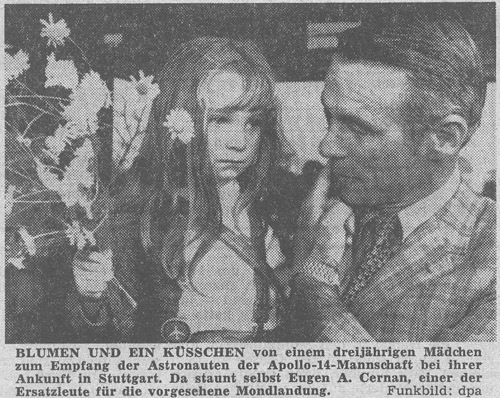 Flowers and a kiss from a three-year-old girl during the reception of the Apollo-14-astronauts at their arrival in Stuttgart. Even Eugene A. Cernan, a member of the backup crew, was astonished. 11 August 1970 "These are moon-flyers..."
13 August 1970 "Moon-flyers are resting in the Sun"
13 August 1970 "They've Discovered Romance in the Giant Ries-Crater"